This week at Momentum, CE National has honored several couples and a family for their various ministries. Yesterday, Mike and Margie Brubaker were inducted onto the CE Wall of Honor. Mike is currently on staff at Grace Community Church, a Grace Brethren church in Frederick, Md. 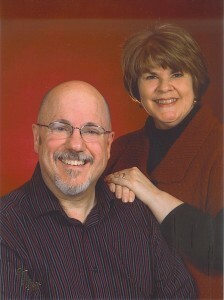 (R. Dallas Greene, senior pastor). Margie is a licensed counselor in private practice. The two have attended Momentum for many years as the “shepherd of the shepherds,” providing a listening ear to those who are hurting or in difficult situations. The CE Wall of Honor is located in the Russell Center at CE’s Winona Lake, Ind., headquarters. It is designed to recognize faithful servants in ministry. To be considered for the Wall of Honor, an individual or couple, through their connection with CE National, should have had a significant influence upon others by their ministry, equipping others to serve, including a special emphasis in church ministries. Significant influence should include one or more of the following: providing ministry trainin, training others in evangelism,providing acts of service to the organization, involvement in encouragement, discipling others, and modeling a godly Christian life. Last night, Jim and Laura Umpleby were recognized as the Youth Leaders of the Year. They work with Driven Student Ministries at the Osceola, Ind., Grace Brethren Church (Greg Serafino, pastor). David and Del-Rae Rice, Grace Brethren Church, Lititz, Pa., received the Servanthood Award. The Knepper Family of the Grace Brethren Church, York, Pa., were recognized with the Teamwork Award. Dan and Gay O’Deens, founding pastor of Gateway Grace Community Church, a Grace Brethren church in Parkesburg, Pa., and founders of CPR-3, an organization that provides assistance in national disasters, were recognized for Mercy Ministries. Additional awards will be presented during the national conference of the Fellowship of Grace Brethren Churches, which will be held July 23-27 in Wooster, Ohio. The Momentum Youth Conference continues through Saturday night, July 17, on the campus of the University of Pittsburgh, Johnstown, Pa. For prayer requests and regular reports and photos of events, click here.